As a Summit Express Guest Service Driver, the focus is on the safe transfer of our guests in and around Colorado with primary trips to and from Denver International Airport. 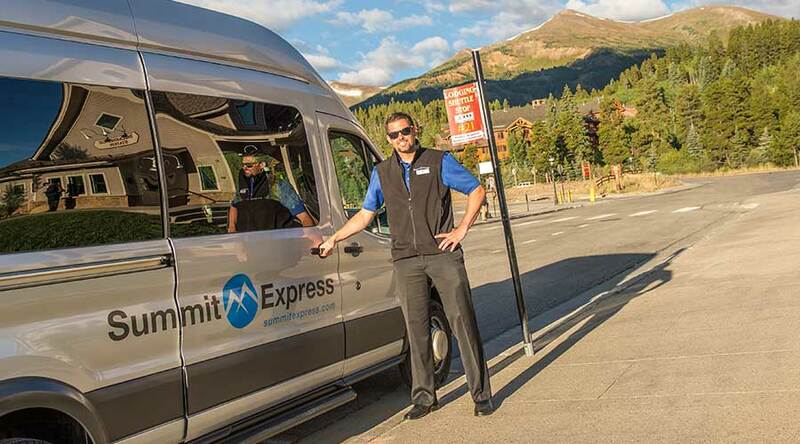 Summit Express utilizes 10 to 14 passenger Ford Transits; 5 passenger SUVs. Summit Express does not require a CDL. $300 Health and Wellness Benefit for Full Time Drivers can be used towards a Ski Pass, a Health Club Membership, or let us know what makes you healthy and well and submit a receipt. Part Time Drivers receive $150 Health and Wellness Benefit. Local Partners with Summit Express offer discounts to our drivers, anything from restaurant discounts to oil change discounts to dry cleaning discounts, and many more. Arrive on time for your trip in your clean, company provided uniform; complete pre-trip vehicle inspections; understand your manifests and map your pickups and drop offs; load and unload your guests and their luggage; complete post-trip vehicle inspections; clean and fuel your vehicle. Communicate effectively with Dispatchers, Transfer Drivers or Airport Greeters regarding guest concerns, road conditions, vehicle problems, etc., it takes a team. Must have a valid driver’s license with a clean Motor Vehicle Record over the last 3 years. Be able to pass a DOT (Department of Transportation) Physical Exam and provide Summit Express with a copy of your medical card. We thank you for your interest in Summit Express! If you would like to join our team, apply now! Provide the BEST service to our guests through safe, reliable access to their destinations by team members who strive to create the BEST work culture in our resort communities.